Cherries Jubilee – Available February 1st – May 15th. No nuts! 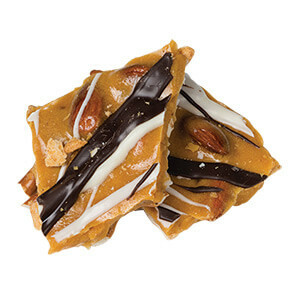 Just large Bing cherries and brittle, drizzled with premium milk chocolate. Raspberry Dream – Available February 1st – May 15th. 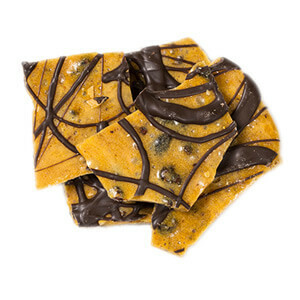 Rich dark chocolate drizzled over plump dried raspberries in crispy brittle. 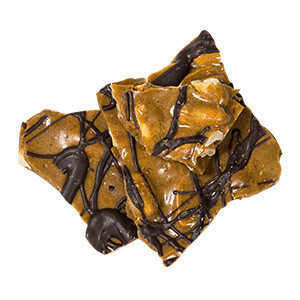 Poppin’ Time – Natural popcorn freshly popped with salted pretzels scattered on top, and then topped with Just Peanuts Brittle Bark and finished with drizzled chocolate. CinnaSwirl – Cinnamon crisps sprinkled on top of freshly popped natural popcorn that is drizzled with plain Brittle Bark, dusted with cinnamon sugar, and then drizzled with white chocolate – YUM! Game Time – The perfect every day snack! 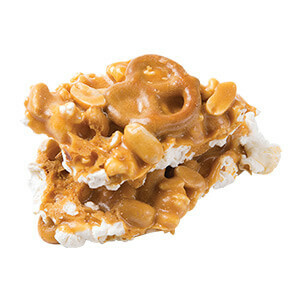 Popcorn and pretzels lightly covered with handmade peanut brittle – absolutely addictive! Popcorn Bacon-Peanut – Crispy thick-cut bacon pieces plus extra large Virginia peanuts are added to brittle right before pouring on top of all-natural freshly popped popcorn. Addictive! 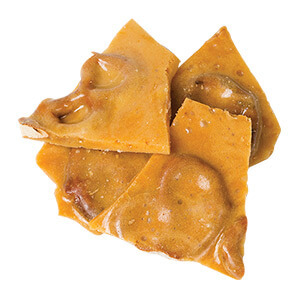 Spicey Nut – A nut medley tossed with smoked paprika and a pinch of chipotle gives this popcorn brittle a “little” heat! 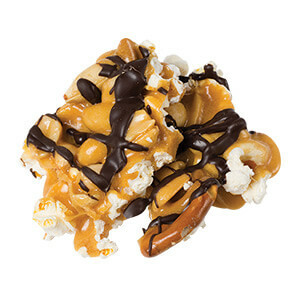 Crispy caramel loaded with the spiced nuts are poured on top of freshly popped natural popcorn for an incredible treat! Pretzelmania – Salted pretzels, cinnamon crisps, and ribbons of coconut are covered with brittle made with whole almonds and tiny pretzel balls. 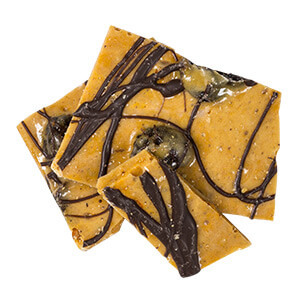 We drizzle it then with white and dark chocolate for an unforgettable treat! Just Peanuts – Like NO OTHER you’ve tried! 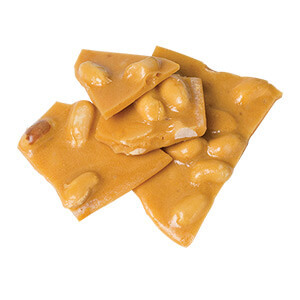 Extra thin and crispy brittle made with whole jumbo roasted peanuts. 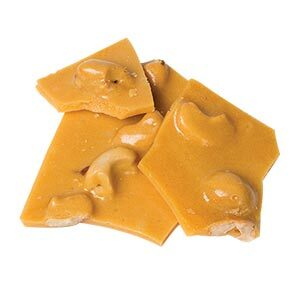 Just Cashews – Loaded with salted cashews, this variety will become a favorite!! Pretzel Lovers – Salted pretzels and sweet brittle make an excellent no-nut combination that is salty and sweet and PERFECT any time! Oh Nuts! 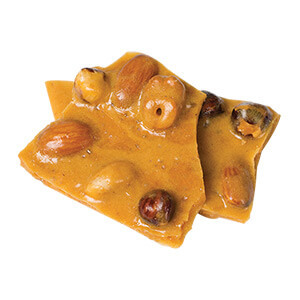 – Whole almonds, cashews, hazelnuts, and a few peanuts tossed in, then poured thin for a real treat. Cherry Pecan Tart – Sour cherries and pecan pieces in thin crispy brittle. 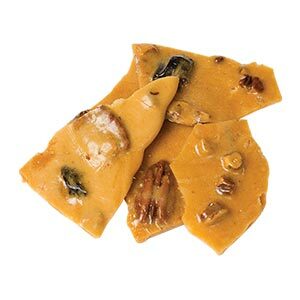 Mocha Peanut Brittle – Rich dark roast coffee flavors the creamy brittle before we add jumbo peanuts for a one-of-a-kind peanut brittle variety. It’s then topped with drizzled dark chocolate. 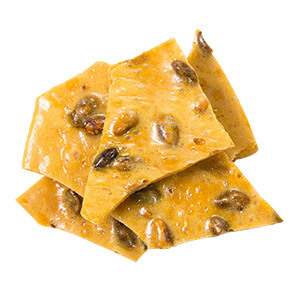 Pistachio Twist Brittle – Whole pistachios in creamy brittle made with a twist of lemon – refreshing and delicious!